Just days away from completing a nationwide switch from analog to digital television, South Korea has announced plans to continue analog TV broadcasting in border areas so that North Koreans don’t lose access to the signals. Overseas radio and TV broadcasts are about the only free media available to North Koreans, although reception isn’t easy. Officially banned from receiving such transmissions, North Koreans typically have to modify reception equipment and listen or watch in secret. It’s difficult to know the exact number of people who tune into South Korean broadcasts. The signals don’t reach deep into North Korea, but they are likely receivable several tens of kilometers into the country. A 2010 survey found a quarter of 250 defectors and travelers interviewed outside of North Korea admitted to tuning into foreign TV broadcasts. The South Korean digital switchover presented a problem because the convertor boxes needed to view South Korea’s digital TV on an analog set are not available in North Korea. So, South Korea changed its plans a little, according to Yonhap News. A government official, who did not want to be identified, said a meeting of related agencies was held recently, with participants agreeing to maintain an analog system for TV transmissions across the border. — Yonhap News, Dec. 25, 2012. The switch brings the analog broadcasts into an interesting area. While South Korea’s government broadcasts anti-DPRK propaganda broadcasts northwards on several radio stations (including Echo of Hope, Voice of the People, and MND Radio), South Korean commercial radio and TV broadcasts have never been targeted at North Korea. They’ve just happened to spread across the border like radio waves do between every country. 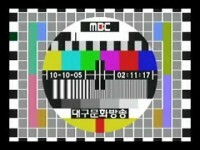 It’s probably one of the reasons why the South Korean commercial broadcasts have never been jammed. North Korea aggressively jams the South Korean government’s radio stations targeted at its own country, which are heavy on anti-DPRK rhetoric. Jamming the commercial stations would take things up a level because it would likely also interfere with reception in South Korea. So, it will be interesting to see if North Korean begins to take any action against the south’s analog TV broadcasts that remain in 2013.